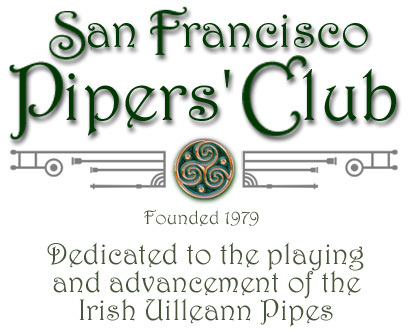 The San Francisco Pipers' Club was founded in 1979 to provide a supportive environment for people learning the uilleann pipes in the vicinity of the San Francisco Bay Area. The club meets approximately once a month and offers free piping, reed making and pipe maintenance lessons to members. Every two years, the club hosts the West Coast Piping Tionól, a weekend-long festival of piping. The club also organizes other events, such as parties and picnics, and hosts visiting pipers. The next club meeting will be on Sunday, April 14, from 1-4pm. Meeting announcements and notes will be sent to the sfpipersclub mailing list. Some of the club members are leading a session that meets on Tuesday nights in Mountain View. Come join us! Questions, comments, feedback are gratefully accepted. For more information, send email to webmaster@sfpipersclub.org.